In mid-October, Huawei took to the international stage to reveal the Huawei Mate 10 in three new flavours; a standard, Mate 10 Pro, and Porsche Design Edition trinity. At an exclusive event at the Bay Hotel in Cape Town, we went hand on with the latter two handsets which are both headed to our shores. In terms of specs, the Mate 10 Pro arrives with a 6? 18:9 display – the first of Huawei’s smartphones to dos so. Where the standard Mate 10 bears an HDR-ready LCD display with a resolution of 2560×1440, the South Africa-bound Pro carries an OLED 2160×1080 display. The Pro handles 4GB of RAM and 64GB of internal storage, and is also available in a 6GB variant with 128GB of storage.The handset runs on Huawei’s new Kirin 970 chipset, which serves as an NPU (neural processing unit) – similarly to Apple’s recently announced A11 Bionic chipset. 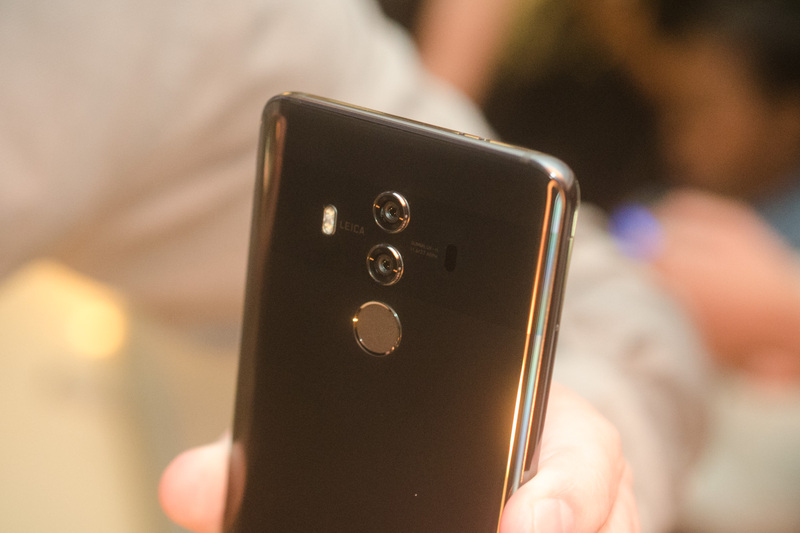 The Mate 10 Pro further bears a rear-facing scanner housed beneath its dual-camera array and benefits from IP67 dust and water resistance, in addition to USB Type-C support. In the hand, the Mate 10 Pro is a svelte effort – a slightly curved rear panel sits snugly in the palm of one’s hand, while the device’s large front panel is dominated by the company’s first 18:9 display. Colours are rich and blacks are deep, despite the fact that the handset lags behind some other contenders with only a 1080p resolution. On the rear, a vertically-aligned dual camera array is accompanied by a subtle colour bar and Huawei’s classic circular fingerprint scanner, while the handset sports a solitary USB Type-C port on its bottom panel. Perhaps the most exciting aspects of the device lie just beneath the surface; thanks to the Mate 10’s Kirin 970 chipset, it is one of the first smartphones to arrive with a neural processing unit – enabling users to endeavour through all sorts of AI trickery. Huawei wasted no time in promoting a new partnership with Microsoft, which will see the Chinese firm leverage Redmond’s optical translation specialities to handle on-the-fly translation – even without an internet connection. The handset can further use its neural processing unit to optimize its camera settings to recognise objects and scenarios, and tailor its output to suit. The Mate 10 Pro’s camera array is constituted by a 20-megapixel monochrome and 12-megapixel colour sensor, while an 8-megapixel selfie camera also debuts. At first glance, results seem as punchy as we’ve experienced from the Huawei P10 – contrast, highlights and shadows appear well-balanced while the handset continues to benefit from Huawei’s depth-of-focus trickery. #HuaweiMate10Pro will retail for R17,999 ZAR. The Porsche Design variant for R26,999 ZAR. The Huawei Mate 10 Pro is expected to retail from R17,999 ZAR on South African soil, while the Porsche Design Edition will retail for the premium sum of R26,999 ZAR. The handsets will be available in Titanium Grey and Mocha Brown. Stay tuned for a full review in the weeks to come!